SHIV YOG KRISHI: DETOXIFY FARMER, FARMING, FAMILYWhereas conventional agriculture requires constant watering of the cultivation land, Shiv Yog AVS Farming does away with over dependency on irrigation. Even with less water usage, the crop, with Shiv Yog Krishi, is abundant, is saved from spoilage and has longer shelf life. Today, the farmer has a choice to either perform wasteful expenditure through synthetic boosting of soil fertility or naturally regenerate the soil with Shiv Yog Krishi and produce Amritasya Organic food, 2-8 times yield than that generated from conventional farming.Shiv Yog Krishi endeavours to enrich, empower and enlighten farmer, farm produce, farmer family and human (food consumer) health.The added benefit of Shiv Yog Krishi is that even as the farmer seeks to energize his field, in the process he also ends up energizing his own energy meridians, organs, thereby neutralising the poison in the body, making it healthy, whole and complete. Whereas conventional agriculture requires constant watering of the cultivation land, Shiv Yog Cosmic Farming does away with over dependency on irrigation. Even with less water usage, the crop, with Shiv Yog Krishi, is abundant, is saved from spoilage and has longer shelf life. Today, the farmer has a choice to either perform wasteful expenditure through synthetic boosting of soil fertility or naturally regenerate the soil with Shiv Yog Krishi and produce Amritasya Organic food, 2-8 times yield than that generated from conventional farming. 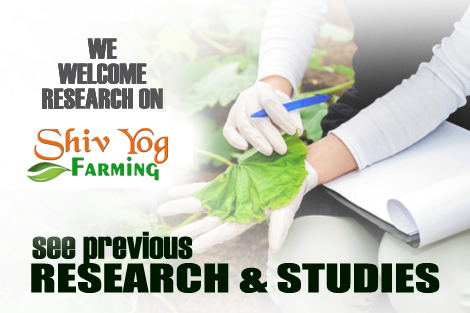 Shiv Yog Krishi endeavours to enrich, empower and enlighten farmer, farm produce, farmer family and human (food consumer) health.